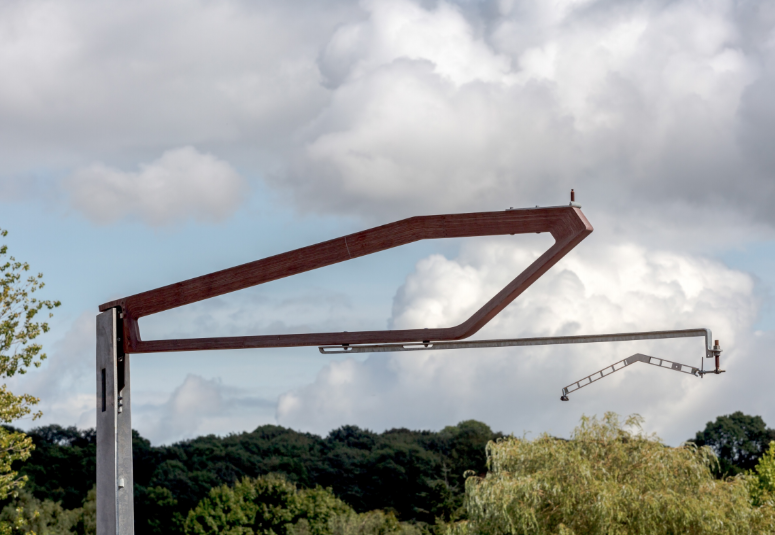 A prototype overhead line structure (OLS) designed to be quick to install, easy to maintain and more attractive to look at has been unveiled by its creators, Mott MacDonald and Moxon Architects. The design is 25 per cent shorter than traditional OLS systems and the two companies say they have been able to reduce the “visual clutter” associated with conventional OLE systems. One of the most interesting features of the design is its cantilever arm, which is made from a densified wood laminate, allowing conductors and supply cables to be fixed directly onto the structural arm without the need for ceramic insulating pots. Presented at InnoTrans 2018, the prototype design is still patent pending. Development began in 2014 when the design was a finalist of the Future Railway competition. It finished ahead of more than 60 similar schemes from 14 countries. Ben Addy, director at Moxon, said: “Railway catenary systems can have an enormous effect on the appearance of high-speed and conventional railway lines as they pass through the landscape. “Our integrated OLS substantially reduces the visual impact of these systems, allowing them to sit more harmoniously within their environment. “However, at a time when efficiency and service performance of our railways is under huge public scrutiny, it is important the strength of our design goes far beyond aesthetics. Awlful design. I think the new Series 2 OHL equipment along with gantries, masts and overhead wires looks more better. Including the Blackpool North line and Bolton Line (which is still being upgraded with new overhead wires). Aswell new overhead wires on the GWML west of Hayes & Harlington and Gospel Oak-Barking line also electrified with new OHL. But the older OHL equipment used on the ECML (most parts of the ECML), WCML out of London Euston, Great Eastern Main Line North of Chelmsford, parts of the Great Western Main Line between Paddington-Hayes & Harlington/Heathrow Junction, most railway lines in Scotland apart from the Falkirk line and Shotts Line which are to be electrified (Falkirk Line already electrified). And other lines in England. Is a better design when those railway lines where first electrified in the 1970’s with AC 25,000v where electric trains and electric locomotives operated and replaced the diesel trains & locomotives (including electrification on smaller branch lines in Essex and in other counties that electric trains replaced the diesel trains). And the LTS (c2c) Line from Bromley-by-Bow & West Ham to Barking, Southend Central, Pitsea, Shoeburyness & Grays have got older OHL (except Fenchurch Street-Bromley-by-Bow that has OHL which were installed in the 1950’s are to be replaced by new OHL equipment in the future) aswell the GEML south of Chelmsford between London Liverpool St-Chelmsford and Southend Victoria line which has been upgraded with new OHL (except parts of the Southend Victoria line that is to be upgraded with new OHL as Network Rail are still upgrading the line between Shenfield and Southend Victoria) aswell between Ardwick Junction (Manchester)-Dinton-Hatfield & Glosslop (formerly Part of the Woodhead Line) which has old OHL that is to be upgraded with new OHL equipment). Which those lines were first electrified as 1500v DC before conversion to AC 25,000v. And HS1 that was built between London St. Pancras and Channel Tunnel to/from France & Europe. When Eurostar was moved from Waterloo International to St. Pancras International in late 2007. Plus with HS2 that is to be built with new OHL equipment and with new high speed trains to be built. The design mentions that the cantilever arm is made from a densified wood laminate. what is design life of such insulation and what is impact of pollution or weather on this design? How the requirement of different system height for overlaps or in restricted condition will be met? it’s not clear either how you would attach the return feeder conductor on an autotransformer +/-25kV OLE system, or how you adjust the vertical and horizontal position of the catenary system to cater for tolerances / inevitable changes in track or mast position.